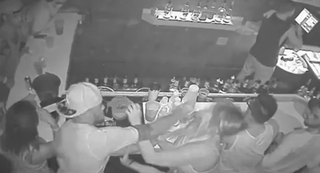 Florida State dismissed quarterback De’Andre Johnson yesterday after video from a Tallahassee bar showed why he was arrested in June for battery. Johnson’s lawyer Jose Baez is now attempting to do damage control, calling the punch an “experience” and also claiming that the woman used a racial slur towards Johnson. “He makes no excuses for what happened,” he added. Baez called Johnson’s dismissal from the football team “unfortunate” and said his client is now volunteering at a shelter for battered women.